Lookout lets you search for—and find—emails, contacts, to-do items and much more anywhere in Outlook within seconds. It is an essential tool for any Outlook user with just a few points left for improvement. Unfortunately, Lookout is no longer in development and does not work with Outlook 2007 or later. Lookout adds fast index search to Outlook. You can find emails, contacts, calendar items, notes, tasks and files on your computer with Lookout. Lookout updates its index silently in the background or when Outlook is idle. A simple search toolbar provides keyword search and more advanced queries using a special syntax. You can specify dates, senders, attachments, keyword count and proximity and more in Lookout. Lookout supports Windows 2000/3/XP, Outlook 2000/2/3 and requires the .NET Framework 1.1. Note that Lookout has not been in active development or seen updates since Microsoft acquired Lookout Software in 2004. The plug-in essentially does not work with Outlook 2007 or later versions (with an error caused by "an unofficial version of the Outlook libraries"). As a worthy alternative, you can try Lookeen, made by some of the people that were responsible for Lookout before. 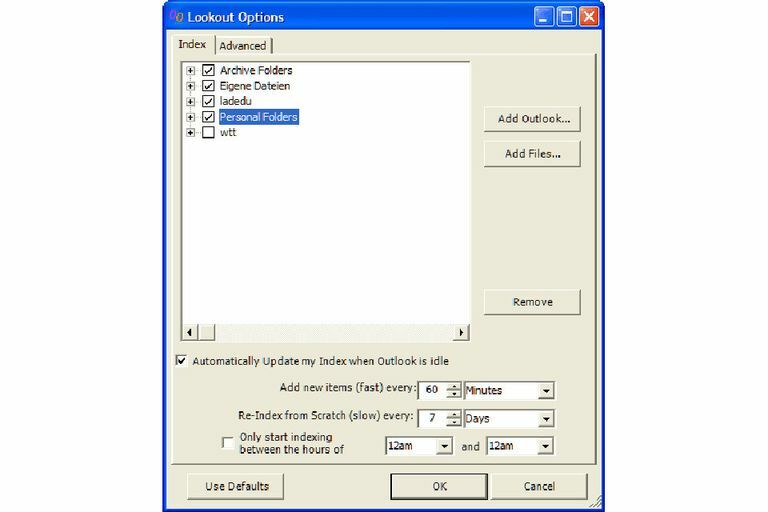 If you download an archived version of Lookout, you may be able to get it to work with Outlook 2007 or later by temporarily removing the libraries that throw off Lookout. Time spent organizing is often time wasted. At least that's the impression you get if you find a search tool like Lookout. Take emails, for example. If you file them diligently to the most appropriate folder, chances are you either look for it elsewhere later or the folder has grown so big that you can't find anything in it. Outlook's search, though feature-rich and precise, has one drawback that can make it next to useless: it takes eons to find anything. This is because Outlook has to go through each item to see whether it matches your criteria. Enter index search. This smarter search technique used by Lookout visits each item once taking note of its contents and maybe some information about it. When you type a few search terms it just has to look them up in its index, maybe apply an algorithm or two to get them in a good relevant order and, boom!, within seconds you have your results. Unfortunately, Lookout does not index new messages in the background as they arrive. Lookout adds a search toolbar to Outlook with a simple entry field that is your gateway to all your emails and other things you store in Outlook. While Lookout also scans files on your computer it does not allow you to search the contents of all types of attachments. If just using keywords doesn't produce the desired results, Lookout lets you build more advanced queries, searching only for emails from a particular sender or within a certain time frame, for example.